10 Easiest Vegetables To Grow - Grow in containers from seed! Top 10 Easiest Vegetables To Grow in the garden! All these vegetables are easy to grow from seed and in containers! 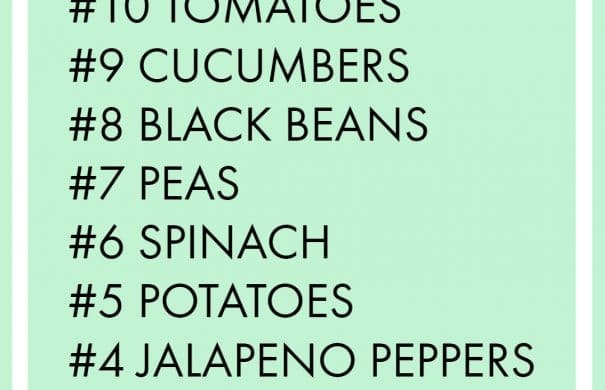 This is the perfect list for a first time gardener! I get asked a lot “I want to start a garden, what vegetables are best for beginners?”. The short answer is ALL OF THEM! The long answer is “Well, they all have their pros and cons and there are so many variables that go into a specific vegetable, but here’s the ones I think that would work best for you depending on your space and climate”. I thought about this recently as this question usually starts to pop up frequently in the Spring. So I decided to make a list of the easiest vegetables to grow in your garden! All of these vegetables are grown from seed and specifically grow good in containers (even sub irrigated planters)! I picked vegetables that can grow successfully across different climates, including heat tolerant vegetables! 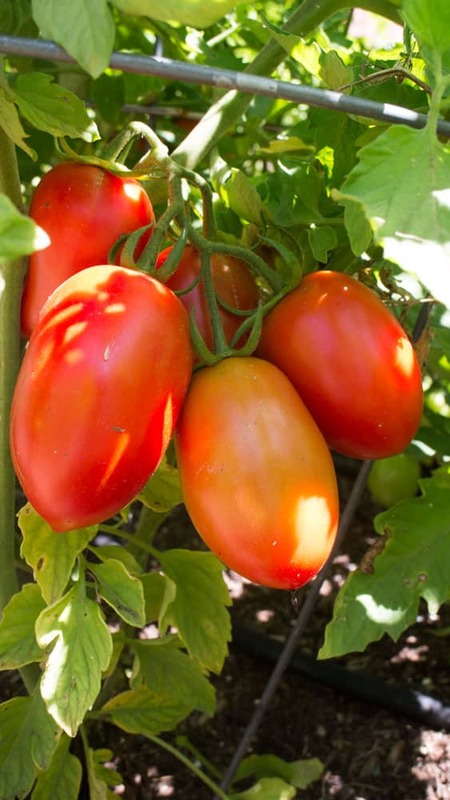 Did you know that one tomato plant can yield 50-80 pounds of tomatoes? Yup, that’s a lot of tomatoes! Make sure to give your tomatoes enough water in the Summer as they continue to grow. Use cages to support the plants as they grow high! Need tomato recipes? Try my reader favorites: Stewed Tomatoes and Oven Roasted Cherry Tomato Sauce. 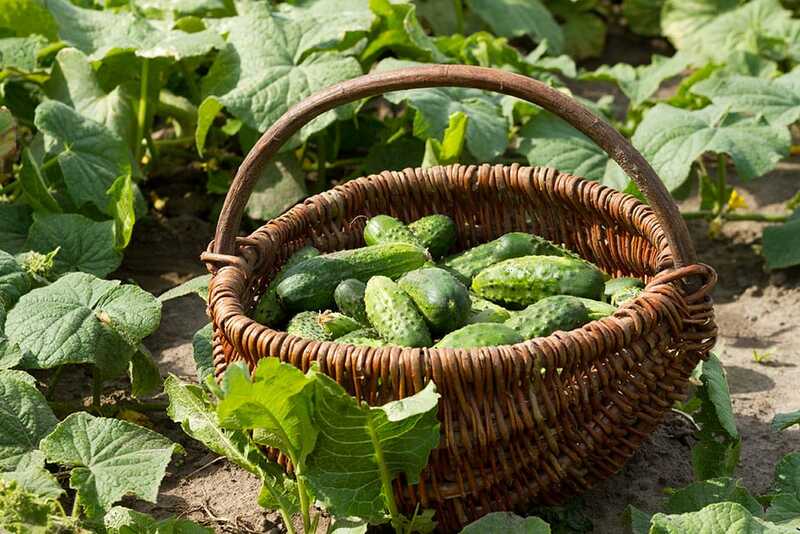 If your goal is to make pickles, grow kirby cucumbers, they are perfect for pickling! Make sure to grow 2 or 3 plants per family! I hope you try my favorite Half Sour pickles recipe! Did you ever buy a pack of dry beans in the store and they last you forever? That’s why growing your own beans is so great! Grow your own black beans for easy preserving! 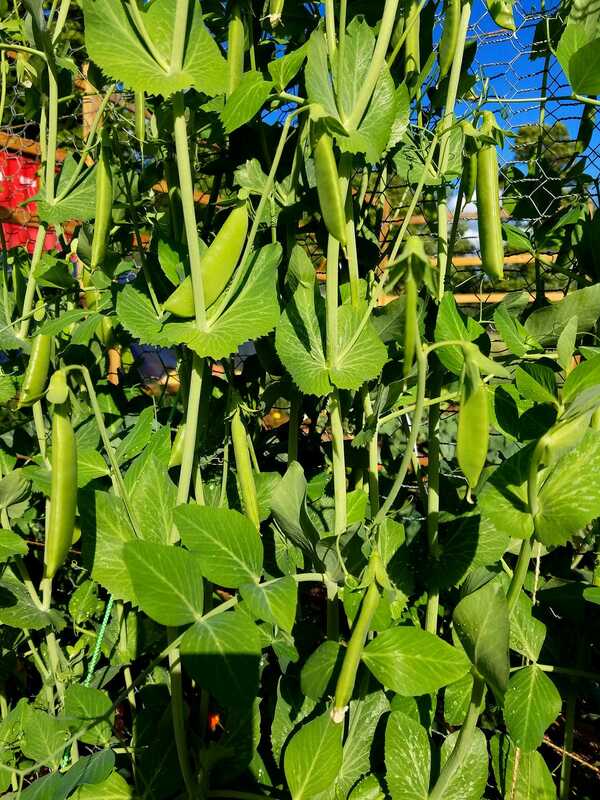 Sugar snap peas are one of my favorite vegetables to grow in the garden because they can grow so high! Make sure to grow them close to a fence or trellis so they have space to grow vertically! Learn how to presprout peas for better germination! Spinach is a plant that is pretty much no fuss. Plant the seed and watch it work it’s magic! 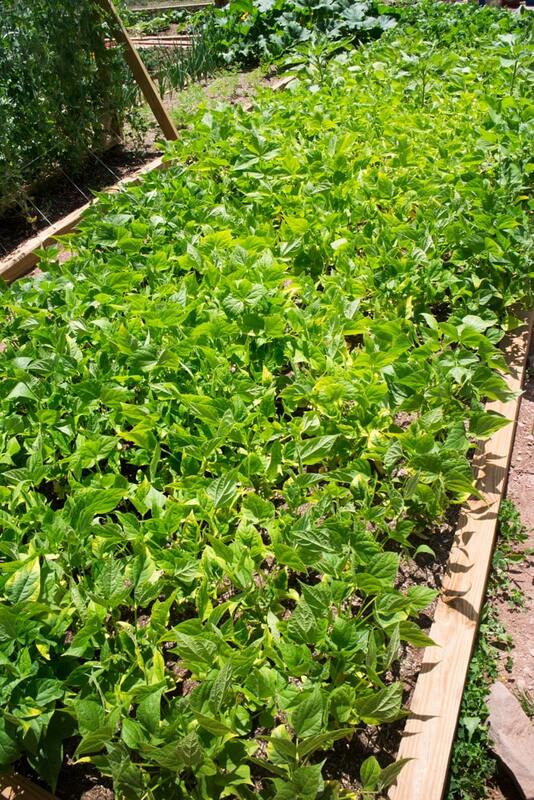 Just make sure to give the plant enough room as spinach tends to take over the garden. Plant a potato under the soil and watch it grow into a potato plant that produces pounds of tomatoes! Well, ok, maybe you need to water it and mound up the dirt as the plant grows, but it’s still pretty easy! 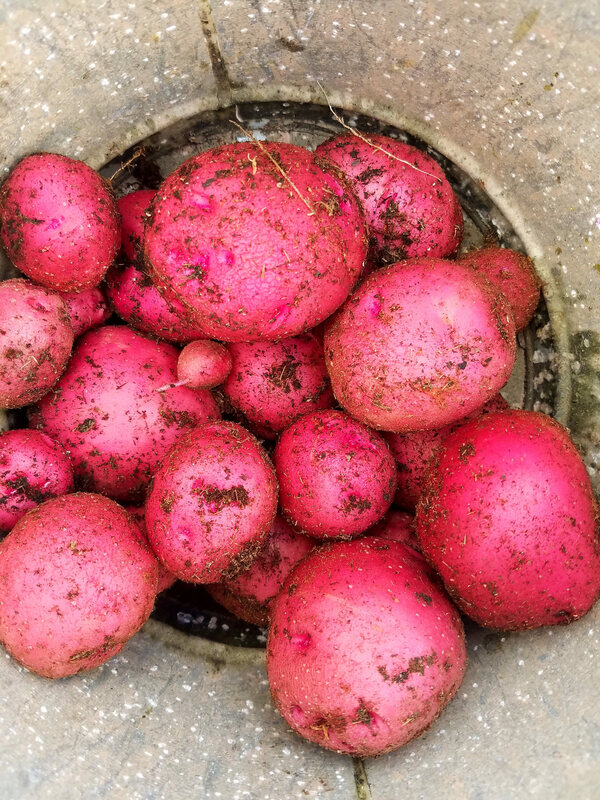 Potatoes are so much fun to dig up when it’s time, it’s like Christmas morning for gardeners! Our little jalapeno pepper plants provide us with so many peppers! 2 plants is plenty for a family! 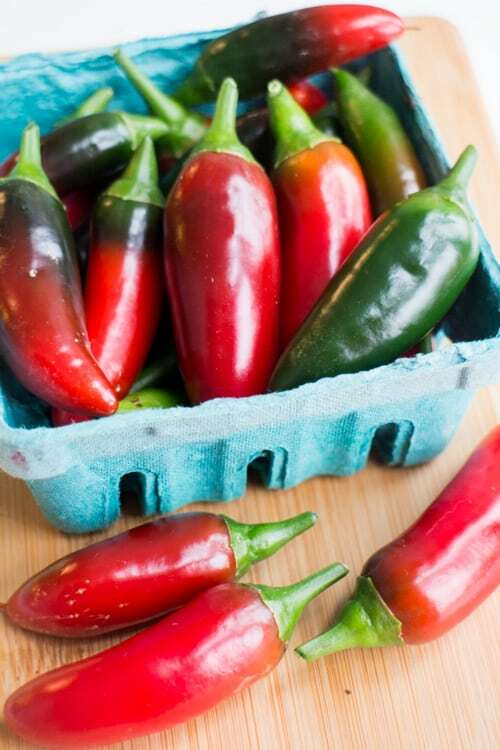 Did you know you can bring your jalapeno pepper indoors once it gets too cold for it? If you have a overabundance of jalapeno peppers, you can easily freeze them too! Warning: lettuce grows great! If you love lettuce for salads, make sure to plant a few heads! When buying lettuce seeds or plants, make sure you pick one that is heat tolerant so it continues to grow in hot temperatures! 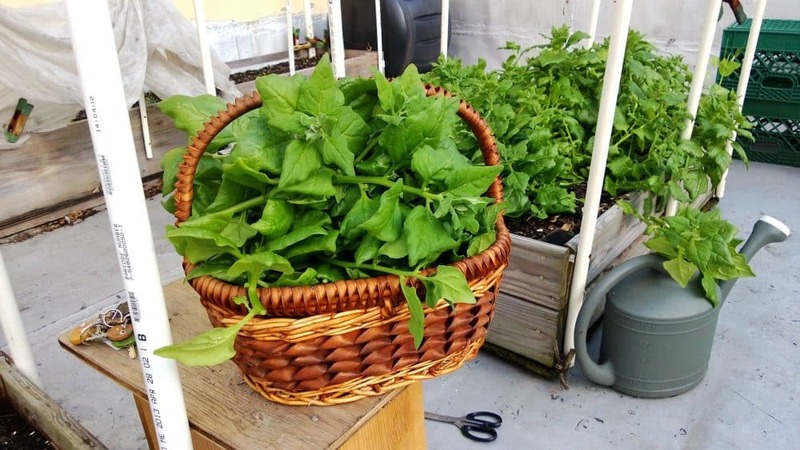 Learn how to store your lettuce after you pick it! If you follow me on Instagram you know that I LOVE kale. I have this green beauty for lunch and dinner almost every day! Kale tends to grow bushy so make sure to give it some room. 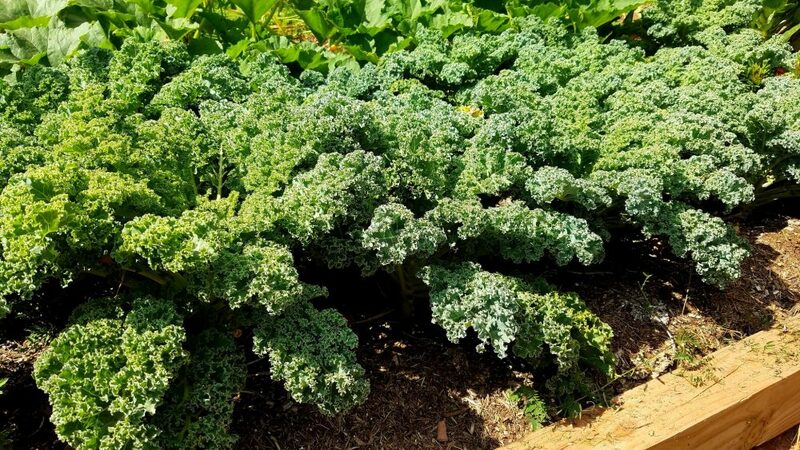 Kale can easily grow through multiple seasons so it’s not uncommon for your kale that you planted during the Spring to last until Winter (even in the snow!). The easiest vegetable to grow in your garden is radishes! Not only do they seem as easy as dropping a seed in a container, but they are quick! Your radishes will be ready for you to pick in 21-28 days! 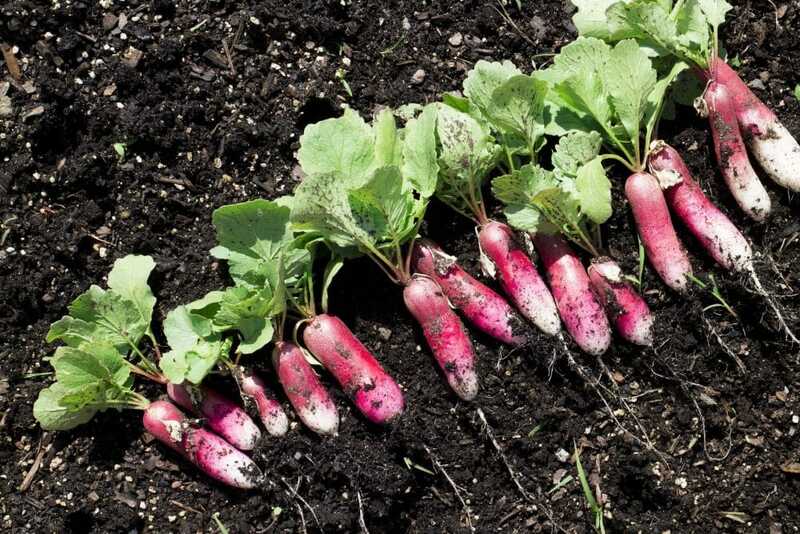 As soon as you pick them, plant again, so you can get multiple radish harvests in a season! 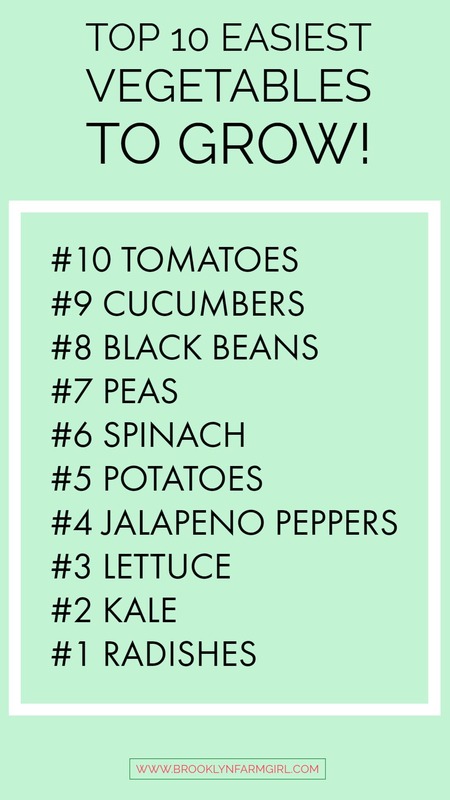 Hope this 10 Easiest Vegetables To Grow list helps first time gardeners as well as the most experienced! 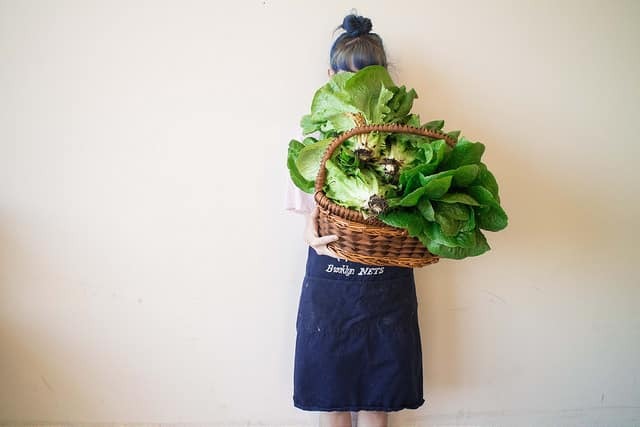 Post some photos of your vegetables on Instagram using the hashtag #brooklynfarmgirl and I will feature you! Happy gardening everyone! If you live in a warm climate, and like them, OKRA is a dream to grow in pots. They all grow from seeds, grow from 3 to 6 feet tall in a 15 gallon pot (I grow some in 5 gallon pots), have a pretty hibiscus type flower, tolerate very hot weather, are an attractive plant, don’t need to be staked, contain about 30% protein, are high in fiber, and bear all season long. Make pickles, add to omelets, soups, stews, are just saute as a side vegetable. For a vegetarian, one of thee most nutritious vegetables. if the slime or “ribbing” bothers you, blanch in boiling water first. 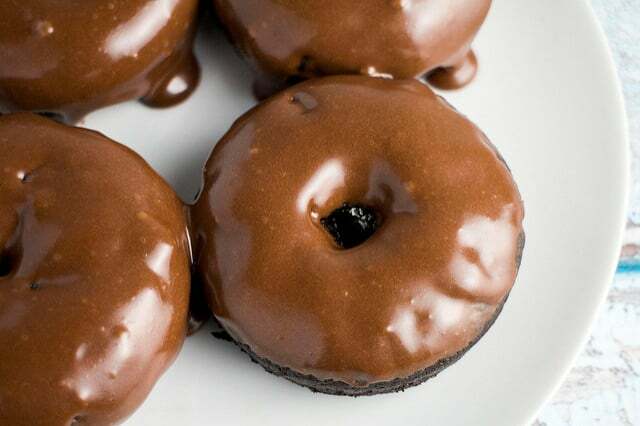 Frying also eliminates the problem. On my list, TOMATOES are #1 (they taste so much better garden ripened) and OKRA is #2 for So. California. Don’ bother with RADISHES as at our local ethnic grocery store, they are 2 to 4 bunches for $1.00. Okra is $3.99 a pound as it can’t be machine harvested. In addition, my wife does not like cooked RADISHES or RADISH GREENS (yes they are edible). So, TOMATOES and OKRA are logical choices. Also enjoy OKRA, TOMATOES, and ONIONS with a strip of chopped BACON and a little water or broth; it is wonderful. Add a spot of CORN STARCH if you don’t want watery broth. Just my thoughts. Loved this post and very timely because this is the weekend I’m planting. Is it too late for some of them? Absolutely not! Have fun Abbe! Let me know how your garden turns out!